The western villages of the Kyrenia area are unique in that they provide a diverse range of activities. Flanked by lengths of beautiful sandy beaches and popular hotels, west Kyrenia has a great range of facilities for travellers from shops, bars and restaurants to fantastic water sports and other more adrenalin pumping activities. 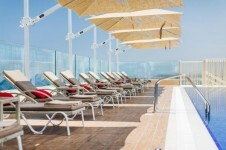 Because each and every beach in the west of Kyrenia is covered in flawless golden sand, the widest range of water sports and activities are available here, from kite surfing and paragliding to wind surfing and scuba diving, and the widest range of Kyrenia hotels, making it an ideal place to choose for Kyrenia holidays. There are such numerous and lengthy beaches there is a range available to suit every taste from popular and public to private to a hotel, there is no doubt that each and every guest will be able to find there spot in the sun in this main holiday destination of North Cyprus. But if you want to spend some time away from the Kyrenia beaches (if you can bring yourself to leave) why not head to the Kyrenia trails around the ‘five finger mountains’, part of the Kyrenia Mountain range that has beautiful tracks perfect for hikers and those on horseback. Wild flowers and colourful birds populate the hilly regions and make the amazing views that much sweeter. If you’ve got something historic in mind, the beautiful St Hilarion Castle is within reach, towering over the Kyrenia area and making the perfect day out for those looking for a perfect photo opportunity as well as one of the best views in the entire country over the coast. If St Hilarion only serves to whet your appetite then head to the ancient city of Lambousa where Roman remains can still be seen including fish storage pools and tombs. West Kyrenia holidays in North Cyprus have something to offer for everyone whether you want to explore below the water, or from the top of a mountain. 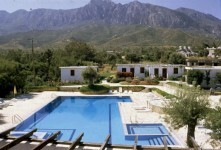 Looking for a holiday to West of Kyrenia ? 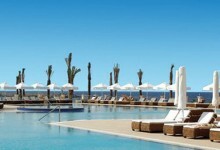 Book cheap holidays to West of Kyrenia , North Cyprus with Direct Traveller.